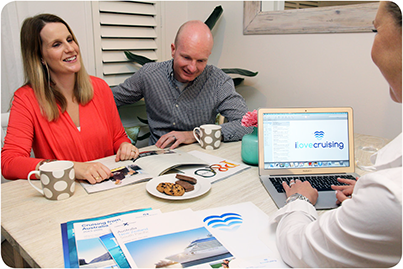 When you book a cruise with I Love Cruising, you will be assigned your very own Personal Cruise Consultant to take care of every detail. Using their in depth industry knowledge, your Personal Cruise Consultant can guide you right through the booking process, advising on cabin selection, dining options and beverage packages, suggesting shore excursions and maybe even tips on what to pack. Depending on your location, your consultant may even be able to meet you at your home or business at a time that is convenient, to discuss the many cruise options available and start planning your dream vacation. If you choose to book a cruise yourself on-line using our 6 easy steps, you will still be assigned your very own Personal Cruise Consultant to oversee your booking. This helps ensure that you’ll get to the gangway without any unforeseen issues arising. To meet your own Personal Cruise Consultant ... Click here.